Disability rates continue to creep up in South Dakota's three metropolitan areas and statewide. South Dakota's disability rate has gone from more than a full percentage point below the national rate in 2008 to a half-percentage point above the national rate in 2013, according to recently updated data from the U.S. Census Bureau. From 2012 to 2013 the state's disability rate increased 1.1 percent, and the number of disabled residents went up from 98,196 to 108,122. South Dakota’s overall disability rate is 13.1 percent, ranking 29th out of the 50 states. The state disability rate is up from 12 percent in 2012 and 10.7 percent in 2008. This compares to the national rate, at 12.6 percent in 2013 and 12.1 percent in 2008. Fall River County and its principal city, Hot Springs, continue to top the list for the highest percentage of residents with disabilities, according to data combined for the years 2009-2013. Sturgis ranks second-highest among South Dakota cities. Both Hot Springs and Sturgis are home to Veterans Affairs hospitals, and Hot Springs also is home to the state veteran's home. Those facilities likely influence these figures, as they draw military veterans seeking healthcare and other services. See interactive charts and exportable data on Disability on the South Dakota Dashboard. The top and bottom three cities and counties are listed below. Meanwhile, the Black Hills region's disability rate - 13.7 percent - is ahead of the overall state rate of 11.9 percent. All metropolitan areas in South Dakota have seen a rise in disability percentages, with Sioux Falls seeing the largest increase from 8.2 percent in 2012 to 11.2 percent in 2013. Rapid City metro area’s rate is 15 percent, making it the highest in the state, followed by Sioux City metro area with a rate of 12.2 percent. Using models of disability from the Institute of Medicine and the International Classification of Functioning, the American Community Survey identifies disability as serious difficulty in one or more of four basic areas of functioning: vision, hearing, ambulation, and cognition. While national birth rates are dropping, South Dakota averages continue to rise, according to a study recently released by the Center for Disease Control. South Dakota is one of six states to have an increasing birthrate. The national rate hovers at 12.5 live births per 1,000 people. South Dakota, however, averaged 14.6 in 2013. Utah had the highest birthrate at 17.6 and New Hampshire had the lowest at 9.4 births per 1,000 births. 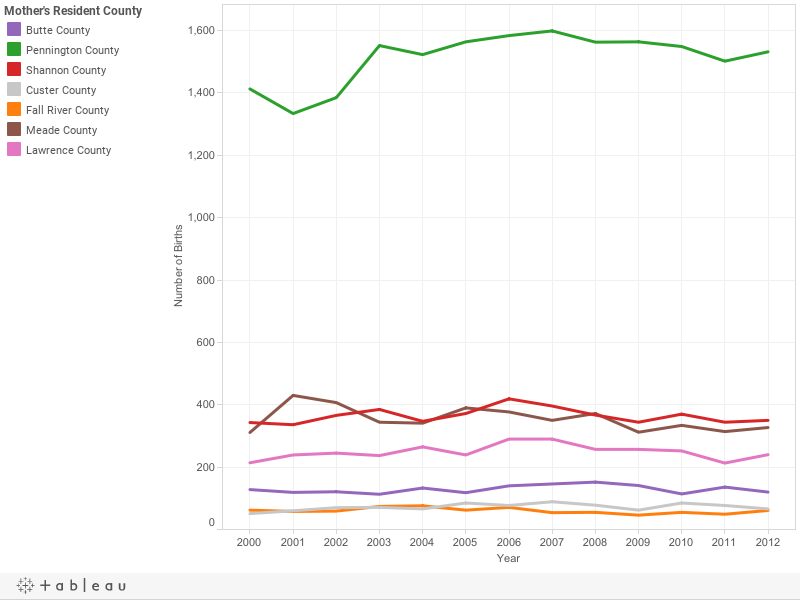 To learn more about regional birth trends in Black Hills Counties, please explore the graph below. Included are the latest numbers from South Dakota Department of Health’s Office of Vital Records Birth Records Database. The seven-year improving trend in South Dakota’s preterm birth rate helped give more babies a healthy start in life and contributed to the improvement in the national rate, according to a recent report card by the March of Dimes. South Dakota’s preterm birth rate was 10.7 percent in 2013, down from 12.7 in 2006, the year the national rate peaked. South Dakota again earned a B on the report card. The national preterm birth rate fell to 11.4 percent in 2013 – the lowest in 17 years -- meeting the federal Healthy People 2020 goal seven years early. Despite this progress, the nation still received a “C” on the annual report card and still has the highest rates of preterm birth of any high resource country. In South Dakota, the rate of late preterm births is 10.8 percent, the rate of women smoking is 26.4 percent and the rate of uninsured women is 16.9 percent. Lowering the late preterm birth rate. Reducing the percentage of women of childbearing age who smoke. These improvements mean not just healthier babies, but also a potential savings in health care and economic costs to society, according to the group. Grades are based on comparing each state’s and the nation’s 2013 preliminary preterm birth rates with the March of Dimes 2020 goal of 9.6 percent of all live births. The U.S. preterm birth rate is 11.5 percent, a decline of 10 percent from the peak of 12.8 percent in 2006. More South Dakotans gained health insurance coverage in 2016, according to federal data. The state's overall uninsured rate dropped from 12.0% in 2015 to 10.3% in 2016. This places the Rushmore State near the national uninsured rate of 10.0%, down from 10.9% in 2015. For those under 18, South Dakota ranked 33rd, up seven places from 44th in 2015. Just 4.5% of individuals under 18 were without health insurance in 2016—the same rate as the national rate. Massachusetts ranked first in this category at 0.9% in 2016. Alaska was last, at 10.0%. South Dakotans between the ages of 25 and 34 experienced an uninsured rate of 17.9%. Overall, however, the highest uninsured rate of 23.4% was found in the group of South Dakotans living in poverty, compared to 8.3% rate for those not living in poverty. Of the Rushmore State’s metropolitan areas, the Rapid City metro area’s uninsured rate dropped to an eight-year low of 10.3% from 15.1% in 2015. By comparison, the Sioux Falls metro area dipped to 8.1% from 8.7%, and the Sioux City metro area fell to 6.8% from 8.1%. In 2016, just 7.9% of South Dakotan adults were diagnosed with either Type I or Type II diabetes, according to the Centers for Disease Control and Prevention. This rate is lower than the national average of 10.5%. The Rushmore State had the 4th lowest rate of diabetes across all 50 states, compared to 20th lowest in 2015. South Dakota ranked behind only No. 1 Colorado at 6.6%, No. 2. Utah at 7.2%, and No. 3 Alaska at 7.5%. West Virginia placed last in the nation with a diabetes rate of 15.0%. At 9.9%, the Sioux City metropolitan area had the highest rate of diabetes among South Dakota’s metro areas in 2013—the most recent year for which data is available—compared to 8.5% for Rapid City and 7.7% for Sioux Falls.Brookings had the lowest rate of diabetes among South Dakota’s metropolitan and micropolitan areas at 6.1%. Spearfish and Vermillion—also college towns with younger populations like Brookings—had relatively low rates at 7.3% and 7.7%. Pierre had the highest diabetes rate for South Dakota’s micropolitan areas at 9.5%, while both Huron and Mitchell had rates over 9.0%. Some correlations can be drawn between income and education levels and the risk of diabetes. Individuals making less than $15,000 had were more than twice as likely to be diagnosed with diabetes (16.0%) than individuals making over $50,000 (6.3 %). Additionally, in 2016, 11.0% of individuals with less than a high school diploma were diagnosed with diabetes, compared to 5.6% of individuals with a college degree or higher. South Dakota's disability rate has remained slightly below the national rate since 2013, according to data from the U.S. Census Bureau. In 2016, the disability rate in South Dakota was 12.2%, or 0.6% less than the national disability rate of 12.8%. From 2015-2016, the Rushmore State's disability rate increased slightly from 12.0% to 12.2%, ranking the state 19th in the nation. The total number of disabled residents in South Dakota increased from 100,775 to 103,296. Disability rates across South Dakota’s metropolitan areas varied slightly 2015 to 2016. The only metro area to experience a decline in in its disability rate was Sioux Falls, which fell from 10.2% to 9.3%. The Sioux City metro area’s disability rate increased over the same period of time, from 11.6% to 12.6%. Rapid City’s rate also increased from 13.3% to 13.7%. Fall River County and its principal city, Hot Springs, had the highest percentage of residents with disabilities at 22.9% and 24.0%, respectively. Sturgis ranked third-highest among South Dakota cities with a disability rate of 16.3%. Both Hot Springs and Sturgis are home to Veterans Affairs hospitals. The South Dakota State Veterans Home is located in Hot Springs as well. These facilities attract many military veterans seeking healthcare and other services, which increases the number of disabled persons in the region relative to the rest of the state. As a result the Black Hills region's average disability rate of 14.6% was higher than the overall state rate of 12.2% from 2011-2015.